The $10 Liberty Head Eagle was designed by U.S. Mint engraver Christian Gobrecht who was inspired by the portrait of Venus in Benjamin West's Painting Omnia Vincit Amor (Love Conquers All). 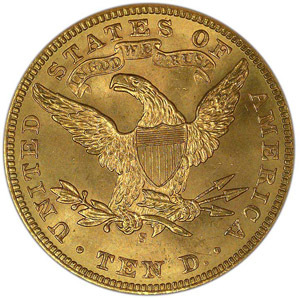 This design also became the prototype for the half-eagle and large cent of 1839. 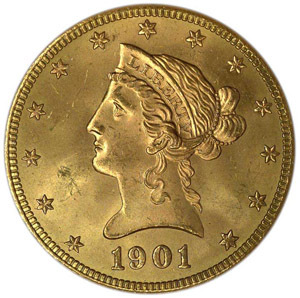 Mr. Gobrecht also designed the $2½ Liberty Head and the $5 Liberty Head gold coins.